The 2018 Acura TLX is a gorgeous sedan that offers an affordable luxury alternative to the likes of the BMW or the Audi. The standard TLX offers plenty of features on its own, but you can also choose from several packages that give you more performance, technology or luxury features so you get just what you want from the vehicle. Even when you max out the features with the most advanced package and options, you still end up spending less than you would on comparable models. The 2018 Acura TLX comes with plenty of features to make even the most practically minded and budget-conscious consumer happy. The base model offers great performance thanks to its 2.4-liter four-cylinder engine with an 8-speed dual-clutch transmission with a torque converter. If you want a little more, you can upgrade to a 3.5-liter V6 with a 9-speed automatic transmission. Both have the option to add an Inline-4 all-wheel drive. Performance is enhanced by the integrated dynamics system and agile handling assist. Exterior features include Jewel Eye LED headlights, a power moonroof, LED-illuminated taillights and brake lights, heated side mirrors, an acoustic glass windshield, and a capless fuel lid. Inside, you’ll find beautiful sports seats with leatherette trim. The driver’s seat can be adjusted 10 ways and has lumbar support, while the passenger’s seat can be adjusted four ways. The front seats are heated, and the rear seats have a 60/40 split for accessing the trunk. Automatic dual-zone climate control is included on the base model, as is humidity control. You get keyless access and push-button start, a leather-wrapped steering wheel, and steering-wheel-mounted controls. Where the base model really shines is in its technology and safety features. Tech features include smart phone integration, Bluetooth connectivity, Apple and Android syncing systems, and text and email reading. Safety features are some of the best for a standard model, and they include a multi-view backup camera with dynamic gridlines, brake assist, hill start assist, collision mitigation braking system, adaptive cruise control, lane keep assist, road departure warning, and LED daytime running lights. You get a lot of features packed into one affordable and beautiful sedan with the base model 2018 Acura TLX. The Acura TLX A-Spec is the performance-focused version of the sedan. The A-Spec is created essentially by upgrading to the V6 engine and adding on the technology package, but those aren’t the only upgrades it contains. It also comes with performance all-wheel steer, and super handling all-wheel drive is available. The 9-speed automatic transmission with sequential SportShift paddle shifters is standard. You can see the difference in the A-Spec model at a glance. The exterior is modified for improved performance, including a black rear spoiler, a black diffuser on the rear bumper, and dual exhaust outlets (round instead of rectangular). It also comes with 19-nich shark gray machine-finished wheels and wider tires. Some of the exterior changes are just for style, such as the dark chrome around the LED taillights, round LED fog lights, and the A-Spec badging. There are some stylish upgrades inside, as well, such as the sport seats with premium leather trim and contrast stitching and piping. The front seats are ventilated as well as heated, and the driver’s seat has 12 points of adjustment instead of 10. But you do lose the adjustments for the passenger’s seat. Some tech upgrades include the GPS-linked automatic climate control, voice recognition for the infotainment system, an electronic gear selector, and red accent lighting. Additional safety features include the heads-up warning and front and rear parking sensors. 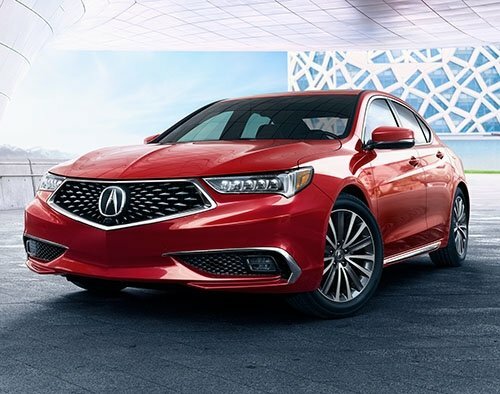 With the TLX A-Spec, you get a high-tech sedan that will also give you top performance. Whether you are interested in performance or just want a nice ride, you can also get great tech features by just adding the Technology Package to either version of the TLX. The Technology Package primarily adds convenience features on the interior that make driving a bit more fun. Some of those features include the GPS-linked automatic climate control, four-door smart entry, voice recognition for the infotainment system, Song by Voice, HD radio, and a navigation system with 3D view and real-time traffic, among other features. Additional safety features with the Technology Package include blind spot monitoring, a rear cross-traffic monitor, and rain-sensing windshield wipers. Exterior and interior features are mostly the same, but the interior is upgraded with leather trim and frameless rearview mirror. The Advance Package includes just about everything that comes with the Technology Package, but it includes a few more luxury extras. The Advance Package includes the V6 engine and all the performance extras, but it comes with 18-inch wheels instead of the A-Spec’s 19-inch wheels. On the exterior, its fog lights are rectangular instead of round, and it has a body-color rear spoiler instead of a black one. Exterior extras include auto-dimming side mirrors and puddle lights. The interior is the same as what you get from the A-Spec, but you get extras like the 12-way adjustable driver’s seat, heated and ventilated front seats, and heated rear outboard seats. You also get a heated steering wheel. The accent lighting is white instead of red, focusing on luxury instead of a sporty vibe. Other extras include remote engine start with vehicle feedback, a surround view camera, the heads-up warning system, and front and rear sensors. Buyers can find just about any features they want in the 2018 Acura TLX, depending on what package they choose. They can get performance, style, luxury, and advanced technology, and they won’t have to spend the exorbitant prices of other luxury vehicles. Create your perfect TLX by visiting your local Acura dealership and trying out the features in person. Take a test drive and see how the TLX feels for yourself!